Who wants to live life in the slow lane? Give your car or truck intense jolts of super-caffeinated, adrenaline-filled boosts. Performance superchargers (and turbochargers) add serious horsepower and trick out your whip like never before. Here’s how it works: More air is pushed straight into your combustion chambers, giving you a precisely-calculated, oxygen-rich air/fuel combo, which results in new levels of power and performance. If that wasn’t enough, they also top out your torque band. Most supercharger kits are a straight-forward, do-it-yourself setup with everything you need to get out of the garage and back on the road. Confused on which one is best for your vehicle? AutoAnything carries all the leading brands, all of which are backed by top notch technical support and great warranties, for worry-free installations. Check out some of the top brands in the biz, guaranteed to wake you up behind the wheel. For a white-knuckle, teeth-clenching ride every time, bolt on an Edelbrock E-Force supercharger—it commands edge-of-your-seat attention, the second you punch that gas pedal. Or, for instant launch off the line, go with a Magnacharger that leaves everyone in your dust. Defy gravity with the street-legal Vortech supercharger and let this sleeping beast lie underneath your hood—until it’s time to come out and play. 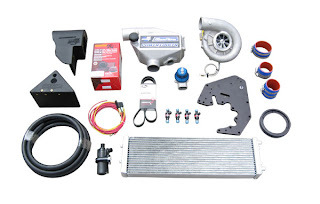 Pack some serious punch with a Paxton supercharger or harness total power behind the wheel with one of the Whipple supercharger kits. What more are you waiting for? Break away from the pack and live full-throttle with one of these supercharger kits in your machine.